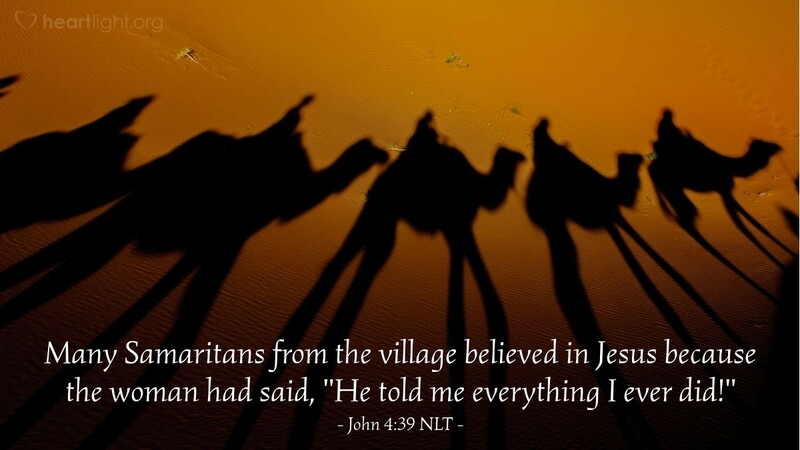 Many Samaritans from the village believed in Jesus because the woman had said, "He told me everything I ever did!" What has the Lord Jesus taught you? How has the Savior shown you God's grace? When did you realize that Jesus could look inside your heart and know you completely ... and still love you with an everlasting love? You see, when Jesus comes into our lives, we have every bit as much to share with others as this Samaritan woman did, and we have far fewer reasons than she did to fear people's reaction to us. So let's follow her example; let's share with others what Jesus has done in our lives. Loving Father in heaven, you are holy and righteous. Only because of your grace and the intercession of the Holy Spirit do I have the boldness to come into your presence in prayer. Please give me that same boldness, touched with gentleness and respect, to share with my friends the wonderful things you have done in my life. In the name of Jesus, your consummate gift of grace, I pray. Amen.